Bird Poop Facial - Buy Uguisu No Fun Geisha Facial Mask Japanese Nightingale Droppings Online > News and Promos > Birdpoopfacial.com is now live! We are now live and ready to take your orders! 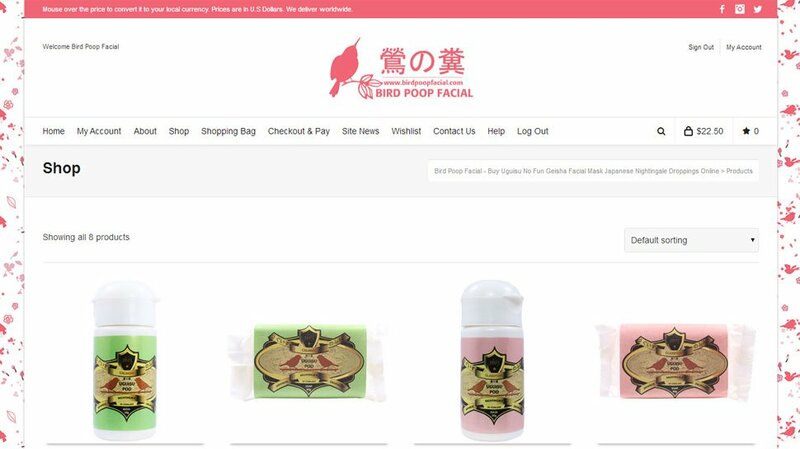 birdpoopfacial.com is a website that sells Uguisu No Fun. Uguisu No Fun, better known as Geisha Facial or Bird Poop Facial, It is a rare and effective beauty treatment performed worldwide on high end clinics and beauty spas that originated in Japan and is used as a facial treatment since the 1600s. As of January 2013, only one company is allowed to produce such product and that is Uguisu Poo Co. Ltd. Japan. Any other product you see that is being labeled as Uguisu No Fun but is not Uguisu Poo brand are 100% counterfeit products. The Japanese Ministry of Health, Labor and Welfare disallow farming and production of Uguisu No Fun on any prefectures with population above 2,000,000 due to rapid decline of the bird’s population in area where human population is high leading to the closure of the Tokyo Based Beauty Culture Inc. that also sells Uguisu No Fun. Uguisu Poo Uguisu No Fun does not use raw Uguisu No Fun. There are unnecessary contents of Japanese Nightingale Feces such as ammonia, bacteria and food residue eaten by the bird that are not needed by the human skin hence, Uguisu Poo removes these unnecessary contents to produce the finest and purest Uguisu No Fun that are scientifically proven to contain 4 times more Guanine than normal Uguisu No Fun. Uguisu Poo Uguisu No Fun are 100% safe and UV sterilized to ensure that it is completely sterile which means that it is free from any harmful microorganisms. Uguisu No Fun, particularly Uguisu Poo brand are known celebrity beauty secrets. Known users include Victoria and David Beckham, Tom Cruise, Tyra Banks, Oprah and Anderson Cooper just to name a few.